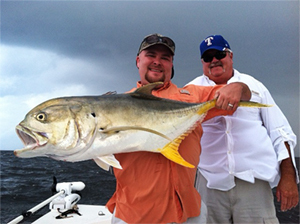 Whether you are after a slot-sized or bruiser Bull Redfish, Gator Speckled Trout, or even the fast and furious Jack Crevalle, Destin inshore / bay / flats fishing trips are sure to offer just what you’re looking for. The term “inshore” describes the inland bodies of water, such as bays, bayous, creeks, and harbors that are situated between the barrier islands and the mainland of Florida. These shallow waters, often averaging less than 3 feet in depth, remain calm on even the windiest of days. Fishing in this shallow water environment is a major plus for those feeling that they may be a bit less seaworthy, or for those who are just less comfortable with being in open water. 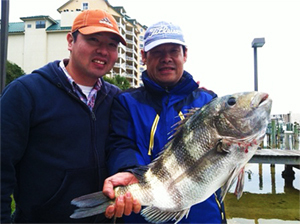 Destin Inshore fishing is not just about finding calm conditions. 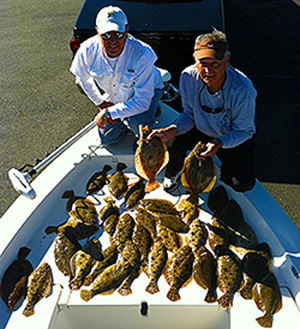 The shallow, fertile waters that make up the Destin Inshore Fishing area are all part of a series of saltwater estuaries that feed from the Choctawhatchee river into the East Choctawhatchee Bay where it subsequently empties into the Gulf of Mexico. These waters are virtually teeming with life. The luscious shallow water grass flats bordered by reed grass shorelines, boundless shallow oyster flats, as well as miles of undisturbed sandy tree lined shore help support an entire ecosystem ranging from small minnows, shrimp, crabs, to Redfish, Speckled Trout, Flounder, Sheepshead, Black Drum, Sharks, and so much more. 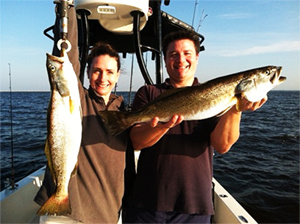 On Destin inshore fishing trips we take into account the season, weather, recent fishing patterns, as well as the desires and skill levels of our clients to employ the most effective fishing method possible. One of the best things about Destin inshore fishing is that there is seldom a need for more than 12lb test rigged on a light action spinning rod. In addition, bait selection will vary widely to include both live bait and artificial baits used in a variety of ways. One thing is for sure, if there are fish out there Capt. LW and his Team of Guides will ensure that anglers of all skill levels and abilities will have the best opportunity to catch them! 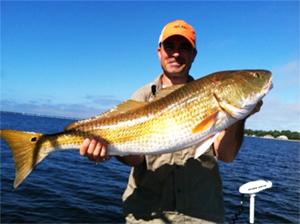 Whether you’re pursuing Redfish and Speckled Trout with a live bait offering or top water lure, IntraCoastal eXperience can accommodate you and your group with the unique light-tackle experience many folks have come to expect from Florida’s Panhandle waters.